• Screen shows "You Are Here"
• Select "Where do you want to go"
Here2There Wayfinding installed on the computers of, for example, the concierge, receptionist or check-in staff, will cater to the audience that prefers a human touch to the service. A simple startup icon on the desk-top provides easy access to the employee. 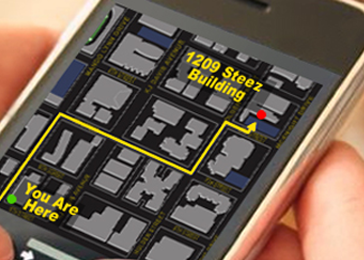 If you have a larger facility, make navigating through easier for visitors by providing them with a Here2There mobile wayfinding app. Combined with a positioning system, Turn-by-Turn directions can be offered. More information on H2T Mobile. 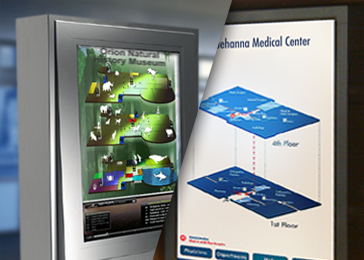 A strategically-placed stand-alone kiosk, or wall-mounted touch screen LCD panel, offers visitors a quick, convenient and easy-to-use option to find destinations. 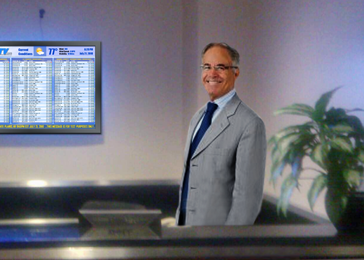 These systems can also be used for onscreen brand-reinforcement, advertising and relaying relevant information to Guests. 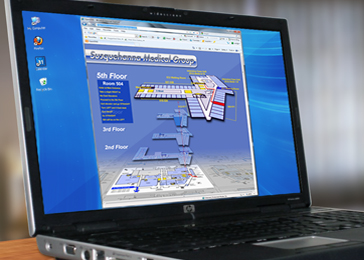 Here2There Digital Wayfinding as a web application lets users get information from the convenience of home, office, hotel, laptop. Ideal for those who like to work out their itinerary ahead of time.